Fixer-Upper Chip Gaines Answers: What's the One Thing We Can Do To Make The Strongest Difference? Hands up if you've missed Chip and Joanna Gaines since the renovation and design duo ended their hit HGTV show Fixer Upper last year. Right? We have too. So, when we stumble upon them unexpectedly on the highways and byways of the internet, we just feel excited to have their unique blend of humor and real talk back in our life. "I'm concerned with the current state of the world, what's one thing I can do to make a difference?" "If you walk by somebody that looks like they need a helping hand, talk to them. Ask them their story. We all get so caught up in our own personal lives that we forget that other people exist and that other people might need an encouraging word from us today. So if you are looking to be encouraged, encourage somebody in the process and it usually goes both ways." We often think of volunteering as something organized and structured, something we do in a group – like signing up to work with a church or organization to build a house or feed the hungry or pack backpacks full of school supplies for children in need. Opportunities to join together and accomplish big things are amazing, but we love that Chip's definition of volunteering also includes the small, quiet interactions that happen one-on-one when we turn our focus outward and notice the people and needs around us. These moments of grace, encouragement and love seem small, but we believe that asking someone for their story – giving them our time, our interest, our attention, letting them know that they matter – can indeed make a difference in our world. 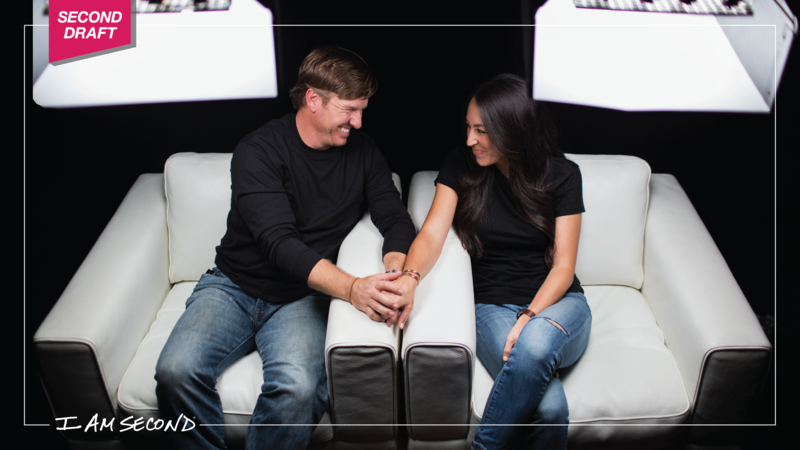 You can watch Chip and Joanna's full film with I Am Second here.